Taken with a polarizer and a 106 ND filter and mirror lockup. I feel very hypocritical submitting this as I have frowned upon people using the same shot or similar shots in different challenges when they are not on the same site since undoubtedly a couple of people will have seen this before and know it´s my shot. I submitted this to an open challenge on the icelandi version of this site, www.ljosmyndakeppni.is, and it did pretty well there. That is not the reason why I am submitting this shot, because I think it will do well but rather that it is my favorite shot in November and the only time I got out during daylight hours to take pictures for myself. The rest of the month I have been at work or doing other stuff during the weekends. I was actually thinking of submitting another shot I just shot right before this with the same exact framing but at 5 seconds and at f8 aperture but the movement of the water wasn´t as nice and I spent about 1 hour editing this so I just didn´t bother. Cooled down the WB in the raw conversion, curves specifically on the water part to darken it, curves again on the whole image and healing brush to remove a couple of straws that were drawing too much attention and finally sharpened after resizing. Wow, the color, composition and depth of field on this are jaw-dropping. Amazing photograph. Well 6 out of 513 is still fabulous and most well-deserved. This by far is my favorite of the challenge. It is a very creative photo and also very beautiful. Thank you for entering it here and feel free to enter everywhere you would like, so that many other may also enjoy it. There is nothing wrong with entering it many places. Það er uppi á þér typpið þessa dagana félagi. Very nice work. I wouldn't worry about the "similarity" issue, in a Free Study it seems fair enough. Congratulations on your top 10..!! Great photo! Congradts on your 6th place finishing buddy! Blue magic. Congratulations on your top ten finish. Very noce work. Message edited by author 2005-12-08 11:31:25. Congratulations on a top 10 finish. This was an incredible shot..I would feel no hypocrisy about entering this in many challenges. Congratulations..it was my top choice for blue; it is brilliant. Til hamingju með 6. sætið flott mynd. Our friends from Iceland :) I still remember your post in the forums. This is beautiful and the colors are fantastic. 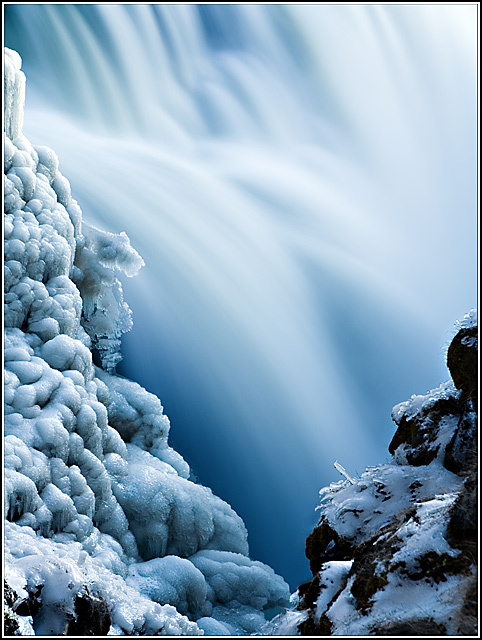 The silky smooth water is a great contrast against the rough texture of the snow and ice on the rocks. 10! Gorgeous shot, good use of the foreground and the stunning background! Bumping up! Wow that look so cold. Love the long exposure on the water. nicely balanced and beautiful tones..
Burrrr that looks so cold. I love the shades of blue. Ahh...Gullfoss. Well executed but not very creative for us who has been there many times. But i guess foreign people will like it. Well done. Winther blues should get the blue ribbon, this is the best shot in the challenge IMO. Gangi þér vel! 8 - Beautiful. Criticism; not much, maybe some even sharper detail on the snow/ice/texture right at the very fore of the shot, but likely difficult to retain the focus in the other areas, so who knows. Tempted to say I'd like to see less movement in the water, to see more detail, but this effect is very nice as is so who knows. Not sure on the frame, especially the black, perhaps brown (or whatever color is in those rocks) would have enhanced it/complemented it better, not sure. Fantastic composition and excellent play of natural textures! 10. Great long exposer, the running water almost turns to ice because of it. breath-taking blue scheme! I love this one! One of the best images in this challenge..the depth of color and composition are both impressive. Nicely done! What lovely framing and a great blue, white and black colour palette. Beautiful... Love the height, color tones, detail, & movement. This one leaves me speechless. Totally stunning, congrats! Terrific, great Xmas postcard or book shot, well done indeed. The hues on this picture are fabulous. The whites and blues come in crisp and clear so much so that I shiver from the cold just gazing upon it. The action of the water as it falls is captured so that it appears as a soft unbroken flow - a downy drift. Wow this looks like a holiday card. Awesome job! Proudly hosted by Sargasso Networks. Current Server Time: 04/22/2019 04:16:31 PM EDT.